I am in love with older aluminum kitchen items! I found this strainer and immediately thought I'd like to try to make something like a clock out of it. Turns out, it was a super easy and cheap project. And it's one item that will stay in my kitchen for years. It's easy. If you want to try it, all you need is an old clock (so u get the parts without having to buy any), an aluminum something that you want to turn into a clock, hammer and a nail. I simply took the old clock part out of the clock, set it aside. Then used a hammer and nail to tap me a hole out in the middle of the aluminum strainer. Which was easy because aluminum is pretty soft. I used a kitchen knife to make the nail hole bigger for the hand. I just inserted it and turned it around and around until it was big enough. 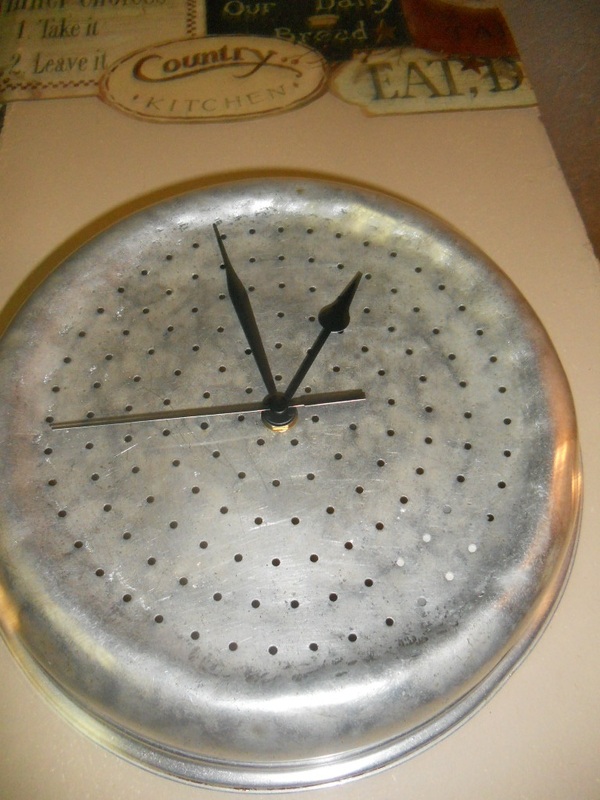 I then just put the clock right in the hole I made and screwed it together. One thing you may notice is that I didn't put any numbers on it. I don't really want any because I think it looks best without any. And it's not the only clock in my kitchen anyways. It was a simple and cheap project. Have you ever re-done an objebt into a clock before?